Ladder Inspection and Disposal: Is Your Ladder Safe To Use? 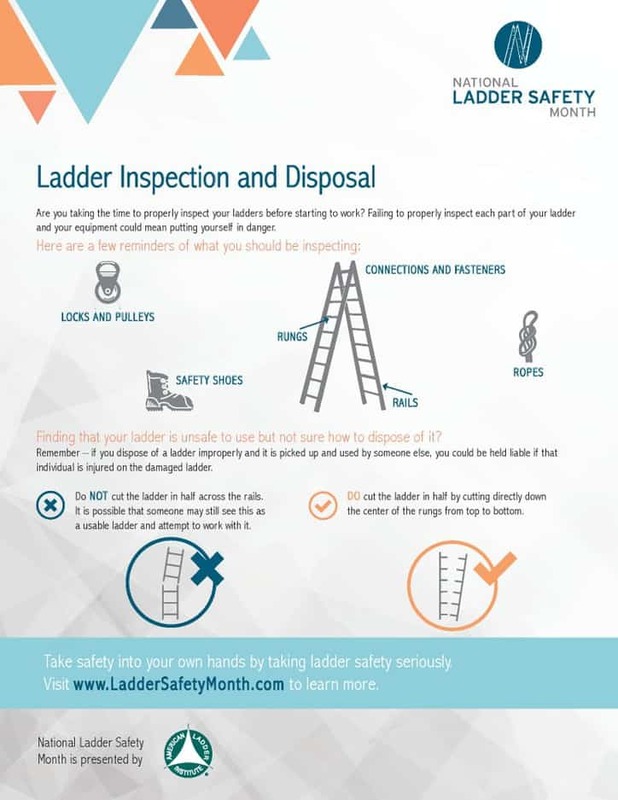 As we enter the final week of American Ladder Institute (ALI)’s National Ladder Safety Month, you should have a better understanding of how to safely use a ladder for a variety of tasks—both at work and at home. But your safety efforts are only useful if your ladder is safe to use. Earning your certificate in ladder safety training won’t save you from a faulty ladder. Make sure you’re using the right ladder for your task. Review this Ladders 101 poster and these infographics to help you decide which ladder is the right fit. If you’re not sure what you’re looking for, check out the above poster for more details. Should you find that your ladder is not safe to use, the final step is to properly dispose of your ladder. Be careful, though! Do not just toss a damaged ladder in the garbage or place it on the curb. If you improperly dispose of a ladder and someone else uses it, you could be held liable if they are injured. The key thing to remember when disposing of a ladder is that it should be impossible for someone else to pick up and use. This means cutting it vertically down the middle of the rungs instead of cutting it in half horizontally. Refer to the above poster for more information. If you’ve taken advantage of the many resources that have been highlighted over the course of March, congratulations! You’ve taken ladder safety into your own hands and can now continue to use and promote safe ladder practices. Just because March is coming to an end doesn’t mean that the attention to safe practices should end—make safety a priority for the duration of 2018! Visit the National Ladder Safety Month and ALI websites for year-round access to all resources.